To start playing on your Ukulele, the very first thing you need to do is Tune it. This step might be a bit hard, but with enough of practice tuning will be just a part of routine, there’s nothing to fear about. The other thing you need to know, is that Ukuleles will detune very frequently if they have new strings or less often with those that are placed long time ago, that just how it is. You will need to tune your Ukulele from time to time, just don’t forget about it! New strings are stretching in the start. Cheap strings just can’t hold tension. The easiest one is to use the tuner. In all honesty, it’s also the most effective and the fastest one! 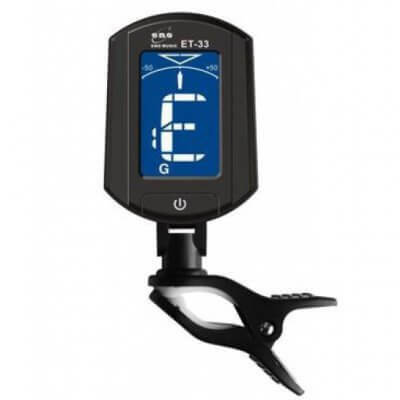 You can buy a stationary tuner that can be attached to the neck or put on the table or your lap and help you tune. Tuner will show you when the string is tuned and when it is not. In the example above, you can see an arrow at the top, an arrow that goes left and right at the bottom and a note that is heard at the moment. The arrow at the bottom should be in the very middle – that means the string is tuned correctly. If the arrow leans to the right – the string is tuned a bit higher than it should be and vice versa – leans to the right, tuned a bit lower. You can also download the tuner on the phone, that will help your tuning a lot. It works exactly like a regular stationary tuner! 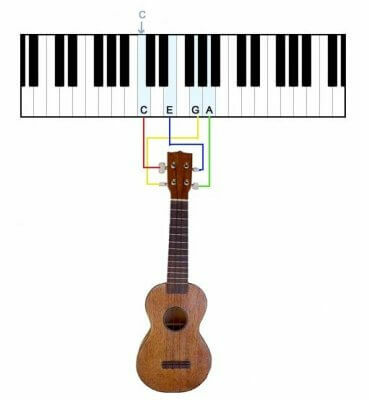 As you can see from the image, the keyboard placement on the piano adheres to the strings on Ukulele, but you will still need to have a good ear. You need to play the strings and play the needed tile at the same time. You will learn to tune on your own, you will not need any piano or a tuner, you will simply learn how the ukulele should sound like and remember how to tune it, but I’ll recommend a tuner, most definitely. This option fits only from experienced players. Stick to first option and you will be fine, but don’t fear to try some other ones. Now it’s time to start building your ukulele skills. Next lesson is waiting for you!